Morgans is the hotel that changed all the rules. 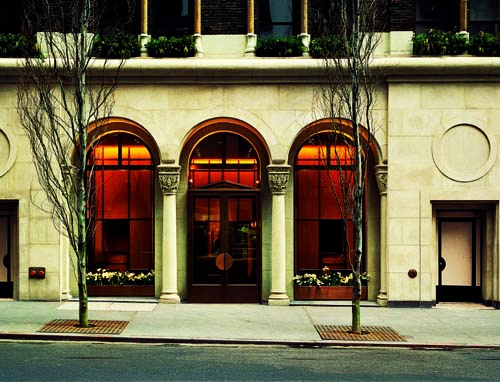 From the moment it opened its doors on Madison Avenue, it startled the world with a convention-shattering attitude and distinctive design sensibility. This grand experiment in style was first concocted by legendary designer Andrée Putman, then again in 2008, when she unveiled a new vision for Morgans. Her powerful reinterpretation of the first “boutique hotel” propels Morgans’ style and spirit forward without changing its unique character. The new design of the hotel interior reinterprets the original monochromatic palette with rich gradations of white, gray and black. Armchairs and foldable lacquered tables by the 1930s designer Jean-Michel Frank accent the lobby, while the elevator and corridors offer another moment of quiet ambiance with soft lighting elements that give a rhythm to the space. Morgans offers complimentary Continental Breakfast and complimentary wireless Internet access to every hotel guest. Morgans Hotel Group guests can enjoy spa services from Equinox’s skilled therapists at the nearest The Spa location. If you choose to enjoy your services at The Spa, Morgans Hotel Group guests receive 15% off when you present your Morgans Hotel Room privilege card and your room keycard at reception Reservations are guaranteed with a credit card. Appointments cancelled with less than a 24-hour notice will be charged in full. Guests under the age of 18 must be accompanied by an adult. 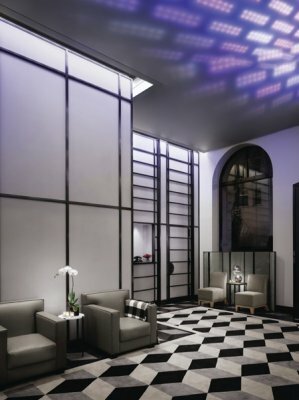 Visit Equinox.com for a list of spa services and Equinox locations. 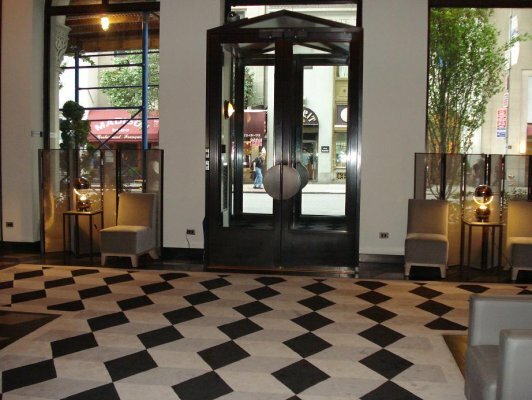 We are pleased to offer all our guests complimentary passes to the New York Sports Club located a block and a half away at 36th and Madison. With state of the art equipment, classes and extended hours we make it easy to stay fit while you travel. Forget your workout gear? We have you covered. Stop by our concierge desk to purchase an Equinox Emergency Workout Pack, including one tank/capri legging combo for women or one tee/shorts combo for men, a Morgans Hotel Group water bottle, and socks. Includes complimentary laundering service. We’re pleased to offer our guests staying in Deluxe room categories and above exclusive amenities and services from our partner, Equinox, whose integrated approach to fitness exudes quality, style and inspiration – complimenting their belief in living life to the fullest. As a Morgans Hotel Group guest, we invite you to experience the Equinox lifestyle for yourself. Please call the concierge to receive your complimentary one-day VIP pass, valid at any of our nearby locations in New York City. Personal Training sessions with the experts at Equinox are available by appointment. Each one- hour body-shaping session includes a mini Equifit Evaluation, at our exclusive Morgans Hotel Group guest rate of $105 per session. Please call the concierge to schedule your session. Please schedule your session 72 hours in advance to guarantee availability. We will, however, try our best to accommodate all requests. Credit card information is required to schedule a session and cancellation notice is required within 24 hours. Step into sophisticated yet understated luxury. Legendary designer Andrée Putman once again triumphs, crafting an elegant and comfortable room that balances history and modernity. Carefully selected furnishings include a hand-stitched, wool-upholstered chair that suggests bespoke tailoring, a metal-inlaid Corian table and La Notte bedside lamps. The striking black-and-white tiled bathroom retains its strong and refreshing visual identity, while sumptuous MALIN+GOETZ bath amenities relax and restore. Thoughtful luxury is infused throughout, from entertainment on demand to the Egyptian cotton linens and plush down comforter. All guest rooms at Morgans are non-smoking rooms. With a new color palette, unconventional materials and meticulously chosen finishes, legendary designer Andrée Putman has refreshed this classic space, seamlessly melding understatement and simplicity with cutting-edge style. 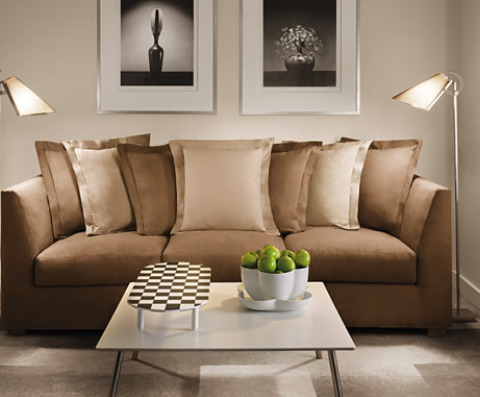 Custom-designed furniture, lighting and textiles harmoniously balance sophistication and comfort. 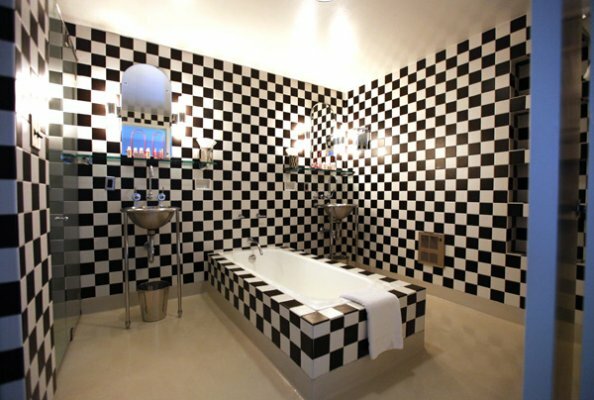 The bold black-and-white checkered bathroom brings a burst of vibrant energy. 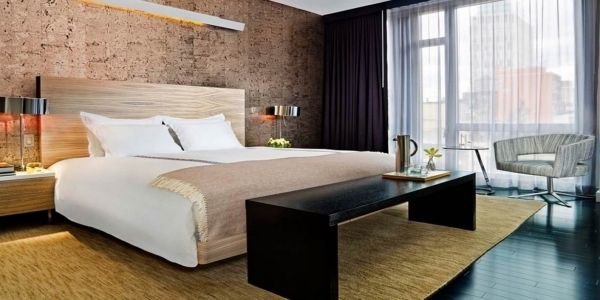 Luxurious amenities include fine Egyptian cotton linens, plush down comforter and pillows, HD flat-screen TV, in-room wireless and sumptuous bath products from MALIN+GOETZ. All guest rooms at Morgans are non-smoking rooms. Recline on the padded window seat in this open and airy room. Legendary designer Andrée Putman has enhanced her original design with a new color palette, lavish materials and thoughtfully curated furnishings. The result seamlessly melds understatement and simplicity with cutting-edge style. The signature black-and-white checkered bathroom retains its strong and refreshing visual identity, while sumptuous MALIN+GOETZ bath products relax and restore. Indulge in luxurious amenities, including fine Egyptian cotton linens, plush down comforter and pillows, HD flat-screen TV and in-room wireless. All guest rooms at Morgans are non-smoking rooms. This extraordinary space is an elegant, exciting mix of influences—a melding of simplicity and sophistication, comfort and invention. Legendary designer Andrée Putman has enhanced her original design with a new color palette, lavish materials and opulent yet relaxed furnishings. 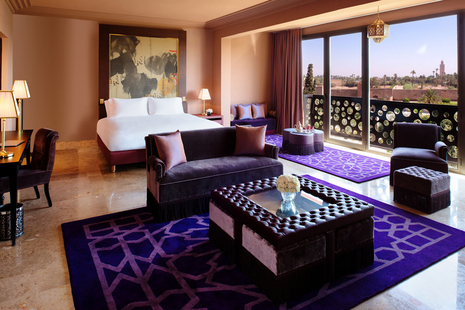 This spacious suite includes an elegantly upholstered sofa, separate dining area and two HD flat screen TVs. Thoughtful luxury is infused throughout, from Egyptian cotton linens and plush down comforters to sumptuous MALIN+GOETZ bath amenities. All guest rooms at Morgans are non-smoking rooms. 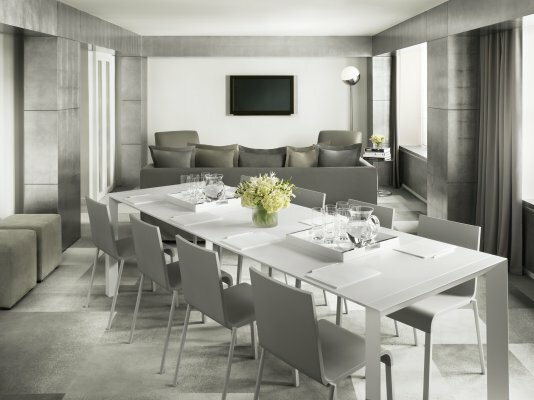 Legendary designer Andrée Putman has once again triumphed, creating a luxurious suite that elegantly balances cutting-edge style and modern simplicity. Carefully chosen furnishings include a hand-stitched, wool-upholstered chair that suggests bespoke tailoring, metal-inlaid Corian table and La Notte bedside lamps that pay homage to Antonioni. The signature black-and-white bathroom references both classic 1930s style and the digital age, with tiles mimicking oversized pixels. 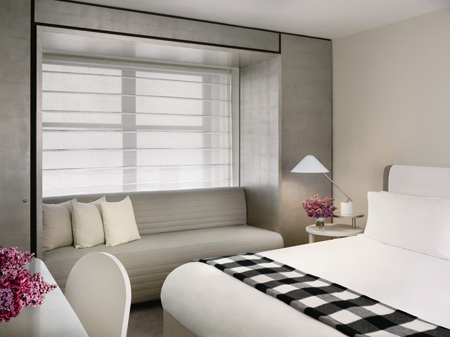 Luxurious amenities include Egyptian cotton linens, plush down comforter, HD flat-screen TV in-room wireless and sumptuous bath products from MALIN+GOETZ. All guest rooms at Morgans are non-smoking rooms. 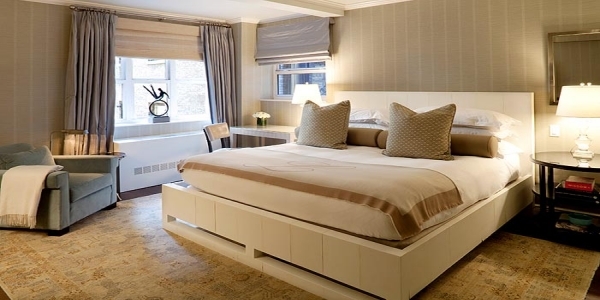 Legendary designer Andrée Putman’s signature blend of simplicity and sophistication, comfort and invention is brilliantly expressed in this elegant suite. An inspired collection of unique furniture fills the space, including a hand-stitched, wool-upholstered chair that suggests bespoke tailoring, metal-inlaid Corian table and La Notte bedside lamps that pay homage to Antonioni. An exposed brick wall contains floor-to-ceiling windows, and the living room and bedroom both offer private balconies. Thoughtful luxury is infused throughout, including entertainment on demand, Egyptian cotton linens and sumptuous bath products from MALIN+GOETZ. All guest rooms at Morgans are non-smoking rooms. 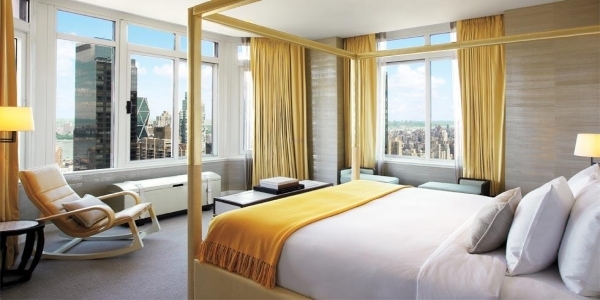 This spacious and elegant suite is one-of-a-kind, featuring an entire wall of windows overlooking Madison Avenue. Legendary designer Andrée Putman has enhanced her original design with a new color palette, lavish materials and thoughtfully curated furnishings. 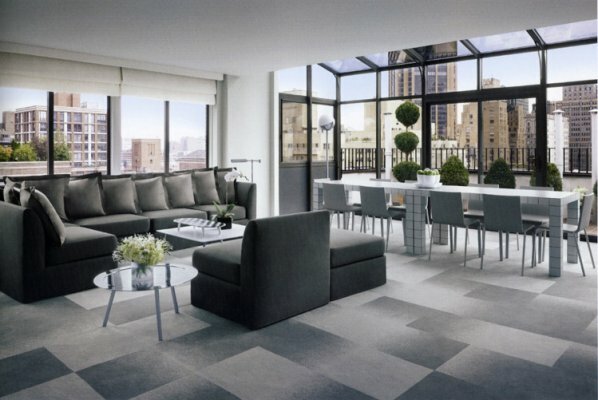 The result is an opulent space that balances cutting-edge style and modern simplicity. The signature black-and-white checkered bathroom retains its strong and refreshing visual identity, while sumptuous MALIN+GOETZ bath products relax and restore. Indulge in luxurious amenities, including fine Egyptian cotton linens, plush down comforter and pillows, HD flat-screen TV and in-room wireless. All guest rooms at Morgans are non-smoking rooms. This generous suite is filled with light, with Southern, Eastern and Western exposures. Legendary designer Andrée Putman has enhanced her original design with a new color palette, lavish materials and opulent yet relaxed furnishings, including a hand-stitched, wool-upholstered chair, metal-inlaid Corian table and La Notte bedside lamps that pay homage to Antonioni. 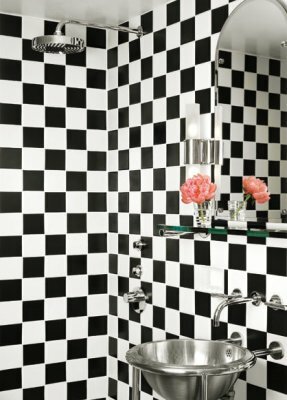 The bold black-and-white checkered bathroom brings a burst of vibrant energy. Luxurious amenities include fine Egyptian cotton linens, plush down comforters and pillows, HD flat-screen TVs, in-room wireless and sumptuous bath products from MALIN+GOETZ. All guest rooms at Morgans are non-smoking rooms. The ultra-chic and spacious duplex Manhattan Penthouse at Morgans is a masterwork of timeless form and contemporary function, boasting its own greenhouse, kitchen, media room, dramatic spiral staircase, and two terraces with stunning city views. Updated by Andrée Putman in 2008, the new design retains the original spirit of the quintessential jetsetter’s private New York City apartment, but incorporates a sense of playfulness with touches like a modular and adaptable sofa and a Putman-designed lamp, Compas dans l’Oeil. Hotel representative will contact you within 48 hours to confirm suite reservation and contract. Max occupancy: 4 Adults. 72 hour cancelation policy. Deposit of one night room and tax will be collected at time of reservation. Room rates do not apply to private events. 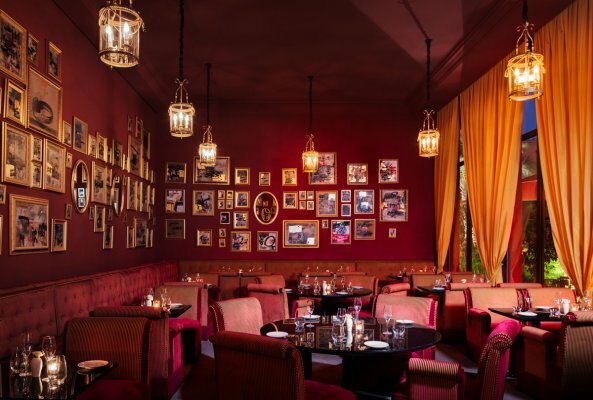 For private events please call 212 726 7504. All guest rooms at Morgans are non-smoking rooms. 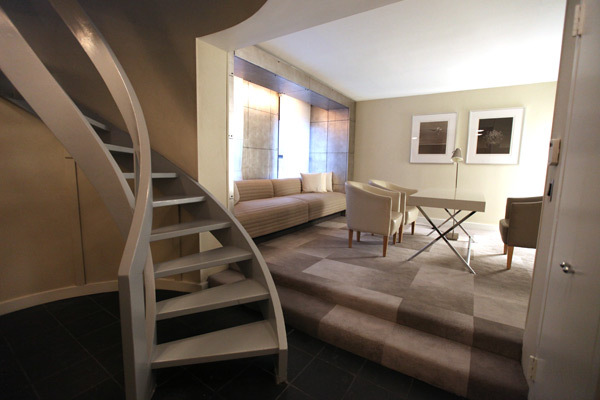 Located in our ultra-chic duplex Penthouse, our complimentary Continental breakfast is located on two floors separated by a dramatic spiral staircase. Breakfast features croissants from Balthazar and the best coffee in New York City. Catch up on the news over breakfast on one of our two terraces with stunning views of Manhattan. Living Room, located in our Penthouse is the ideal place to sit, relax, have a drink, read a book or work on your computer. Complimentary tea and coffee is available throughout the day and can be enjoyed inside or on one of our two terraces with stunning views of Manhattan. Wireless internet access and computer work stations are also available for those intent on working during your stay. Light refreshments are available in the evening from 5pm until 11pm.